Mandolines are great kitchen tools. Chefs swear by them. A good mandoline can save you hours of tedious slicing when you’re making dishes that require regular, even slices like au gratin potatoes, Asian cucumber salad, or cole slaw. Unfortunately, many traditional mandolines cost more than a hundred bucks in fancy kitchen stores. Ouch. Talk about slicer sticker shock. Now you can forget all that. Today’s grommet, the Kyocera mandoline, is priced to bring the joy of thin slices to the deserving masses. That means you! Here’s the real beauty part: This mandoline isn’t just less costly than traditional models, it’s actually better . The secret to this breakthrough is the super sharp ceramic blade. Unlike metal blades, ceramic will never rust and it won’t discolor your food. Another cool feature: the Kyocera is designed to be tidy and portable (no pile of blades or crammed kitchen drawers). Our buddy Owen knows chefs who use the Kyocera even though they could afford the high-end models. 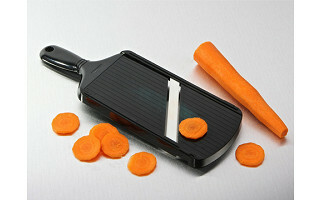 So, say goodbye to mandoline sticker shock — and hello to really great, really thin slicing. The Kyocera Mandoline has become one of my kitchen staples. It's adjustable to four different thicknesses ideal for thin slicing veggies for salads and stir frys; I've also found it useful for shaving parmesan cheese and chocolate. Use it on garlic and shallots too, but watch your fingers! The blade is super sharp. Made of ceramic, it will retain good-as-new cutting abilities for years as long as it's treated properly: try to avoid the dishwasher, and store it in such a way that the blade doesn't get knocked around. Highly recommended by local chefs and national publications alike, this tool is hard to beat. In medium bowl, whisk together the mayonnaise, mustard, jalapeno peppers, sugar, vinegar, Tabasco, lemon peel, caraway seeds, celery seeds, salt and pepper. Add all vegetables, toss, and serve chilled. 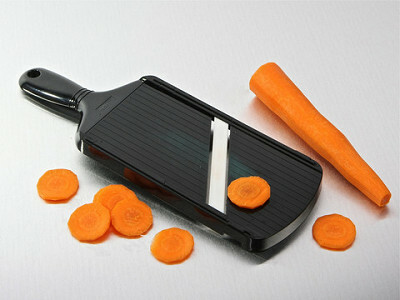 This looks like an awesome slicer! I like using ceramic in cooking. Can I also say that I have seen Kyocera is on the Susan G. Komen Breast Cancer Foundation website as being a generous donator to their foundation. Nice company. @Linda, thanks for passing along their Kyocera charitable efforts. You said that it is a "nice" company. I know that whenever Joanne calls a company "nice" it has a good shot of being a future Grommet. So I kinda smiled when I read that from you. People are buying this like hotcakes. 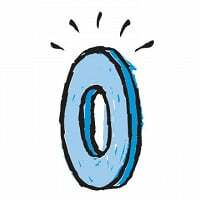 There is often an inverse relationship between the number of sales and the number of comments about a Grommet. Like "I don't want to chat, I just want to buy." Also has to do with the quality of our explanation (did we raise questions, or confuse?) and/or the complexity of a product...this one is pretty straightforward and compelling, I think. To Jules' last comment, it's true confession time: when I noticed on our secret Grommet calendar that we'd be selling a a mandoline, I wondered how we'd ever sell a musical instrument? I mean, I think mandolins are really cool and all that, but I was thinking -- how many people would really buy one of those?! That goes to show you just how far behind I am in the culinary arts department. And even given my basic understanding of kitchen tools, once I saw this, I knew I had to have one! Once again, I'm clicking "buy it now". Thanks to my Grommet friends who are teaching me more than a few things. I've had a mandoline for years, but this one looks like a great option and at such a reasonable price --maybe I'll stock up for shower gifts. Want to emphasize the need for using the handle like Jen does in the video, and using extreme caution when slicing smaller things like a garlic clove, or harder foods. The handle works well for bigger, softer food like cabbage, but won't grip a very firm and dense onion, say. That blade is very sharp, as Owen says in the kick-off comments. I'm getting caught up on some "past Grommets" that I missed when I was away from the Internet. I just ordered this product. I own a competitive product but it never get's the cuts thin enough. I'm told that this one solves the problem. Jen's slaw sounds great. Mandolines are great kitchen tools. Chefs swear by them. A good mandoline can save you hours of tedious slicing when you’re making dishes that require regular, even slices like au gratin potatoes, Asian cucumber salad, or cole slaw. Unfortunately, many traditional mandolines cost more than a hundred bucks in fancy kitchen stores. Ouch. Talk about slicer sticker shock. Now you can forget all that. Today’s grommet, the Kyocera mandoline, is priced to bring the joy of thin slices to the deserving masses. That means you! Here’s the real beauty part: This mandoline isn’t just less costly than traditional models, it’s actually better . The secret to this breakthrough is the super sharp ceramic blade. Unlike metal blades, ceramic will never rust and it won’t discolor your food. Another cool feature: the Kyocera is designed to be tidy and portable (no pile of blades or crammed kitchen drawers).